If you have working knowledge of CSS and HTML, at times you may have felt the need of some additional tool that can produce automatically generated CSS to enhance it further in an easy way. These tools and services may either generate CSS for the entire page layout or may create CSS for individual web page elements. The following list contains some powerful and flexible CSS generation tools that not only saves your time but also helps in getting a cleaner and optimized code for much secure and faster websites. You can either use them to create a web project from scratch or can utilize their features to accelerate and enhance your existing web design process. My favorite tools from this list are CSS sprite code generators and specialized tools to create vendor-specific CSS code for different page elements. CSS3 Generator - This powerful CSS3 generation tool is ideal for speeding up your complex web design project. It offers several advanced options for generating code for various CSS3 properties. You simply have to provide the parameters through point and click controls which include a handy preview section to see a change in real time. Once satisfied with the parameters, you can easily copy the generated CSS for using in your project. PrimerCSS - This excellent tool is perfect for extracting CSS classes and ids from a HTML template. Just copy paste the HTML code from which the extraction needs to be done and it will scan and create a blank CSS style sheet with all the ids and classes present in the pasted HTML code. This tool is ideal in conditions where you're working on 3rd party ready made HTML templates and quickly want to customize them through your own CSS directives. List-O-Matic - As the name suggests, this flexible tool is ideal for automatically generating CSS for different styles of navigation menus in the form of unordered list. In fact, it produces both CSS and HTML in two separate sections for your convenience. You must supply the menu options (anchor texts and URLs) including the style from the collection at your disposal. It's one of the fastest ways to create CSS for navigation elements. SpritePad - This is one of the easiest CSS sprite code generators with excellent interface. You get a clean sprite map that can be populated with the relevant images for sprite generation. It automatically arranges the image map and creates corresponding sprite image with the associated CSS code ready for use. Simply upload the generated sprite image and copy paste the CSS code within the relevant file to use the sprite-based navigation. CSS Layout Generator - You can easily generate a fixed or fluid width page layout through this user-friendly tool. One can easily select various properties associated with the entire layout and can get the corresponding CSS code to start a new web project within minutes. It also shows preview while you modify or select the layout parameters. This helps you in coming up with the correct data to get the right kind of page layout that matches with your requirements. Ultimate CSS Gradient - With the advent of CSS3 and modern browsers, use of gradients is quite common among web designers. The biggest problem while manually writing gradient CSS is experimenting with the visual effects by supplying different values. This handy tool lets you create different types of gradient patterns through point and click controls. It also generates vendor-specific CSS code to make your web design compatible with all major web browsing clients. CSS Border Radius Generator - I often use this tool to quickly create CSS for sections having custom border radius on all the four corners. This awesome tool lets you specify the radius for all four corners individually and can generate CSS code both for Firefox and Google Chrome. It's ideal for making rounded corner buttons, banners or custom div sections for your web page layout. The generate CSS code is completely optimized and works in almost every popular web browser without any hiccups. 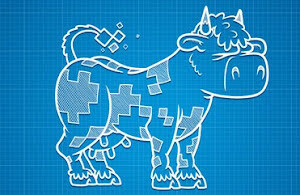 Sprite Cow - This is yet another powerful CSS sprite generation tool with a pleasing Mac interface. It lets you choose the background of the sprite if your design doesn't require a transparent one. You can also create retina-ready sprite through this flexible tool. You can also specify the percentage positioning through this tool while generating the CSS sprite to accurately align the images within a single sprite image. CSSTXT - Newbie web designers will find this utility extremely useful in beautifying the text sections within a page layout. Its handy point and click attribute controls lets you specify various parameters to customize the look 'n' feel of the text as per your design requirements. The resulting CSS can be easily copied to be used in your default stylesheet present on your web server. It can also be used to quickly insert dummy text during the design or testing phase. CSS Crush - Advanced users can use this CSS preprocessor to facilitate automate vendor prefixing, use of macro style variables, direct import of style sheets, use of inbuilt functions and much more. It speeds up the CSS coding process giving you nifty tools to quickly generate, indent and modify large style sheets in a relatively short period of time. You can directly host this CSS preprocessor on your test server and can use it to generate optimized CSS code for creating lightning fast websites. CSS Portal Layout Generator - It's one of the most flexible CSS layout generator tools on the web. Its user-friendly layout generation wizard lets even a newbie create custom web page layout as per his requirement. The generated CSS code is completely optimized and is very easy to use in an existing project. You can generate different HTML & XHTML complaint CSS code through this tool to make it compatible with your existing code. CSS3 Button Generator - Gone are the days when web developers used to create fancy images in Photoshop to create buttons for websites. This intuitive tool lets you create highly customized CSS3 button code that can be directly used in your projects. The sheer amount of custom options is good enough to generate hundreds of button styles and that too within minutes. The generated CSS code is clean and optimized and can be easily imported into your existing style sheet. CSS Creator Layout Generator - This popular layout generator also includes a color picker to easily specify the color scheme of various page sections in an easy way. Like other standard layout generators, this one is also capable of generating different HTML & XHTML complaint CSS code. You can also see the preview of the layout before exporting the CSS code. This tool can generate both fluid and fixed-width layouts. You can specify the dimensions of various page elements in pixels, ems or in percentages. CSS3.0 Generator - This popular tool is extremely useful in generating CSS code for various CSS3 specific properties like gradients, text shadow and much more. Select the appropriate property and fill in the desired parameters to get the CSS code for the same. You also get the preview pane to visualize changes in the page element once your start supplying the values of the parameters. The generated CSS code works in all modern web browsers. ZURB CSS Grid Builder - If you prefer to use grid-based layout for your web design project, then this tool is made just for you. You can easily generate CSS code for custom grid layout with desired parameters required by your design. This tool lets you create CSS grid code for large as well as standard screen dimensions too. You can adjust the column and gutter width very easily by point and click controls.